and add some privacy to thier home or business. Sierra Shading wants to save you money. With interior shading, the best way to accomplish that is to provide you with Cellular Shades for your home or office windows. Some even qualify for rebates & credits. 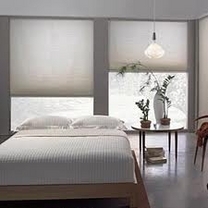 Cellular Shades easily coordinate with other types of interior shading. There are more than 200 fabric choices and are very stylish with energy saving technology. Cellular Shades are created with high quality components and are meant to last. From light filtering to blackout, you will love the energy savings and beauty. The transfer of heat & cold through your windows can account for 10% to 20% of your home's heating and cooling costs. This means you can expect to save money after Cellular Shades are installed. These shades eventually pay for themselves. 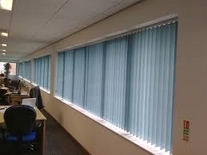 Sierra Shading can provide very basic "mini blinds" or high quality commercial grade horizontal blinds. Horizontal Blinds are extremely versitile and can be created with multi-colored slats, inverted slats, no holes for extra privacy, cut outs to accomodate odd shapes, and even cordless operation. Sierra Shading can enhance your existing interior with the irresistible beauty and elegance of Wood Blinds. Wood Blinds are constructed from wood or faux wood and finished with a large array of stains, paints, & textures. Wood blind manufacturers commonly design them to blend with your flooring, furniture, cabinetry, and other existing wood finishes in your home. 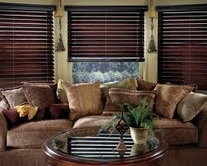 Wood Blinds are even more elegant when appointed with decorative tape and wood valances. 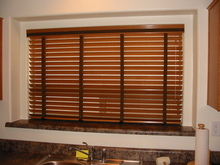 These appointments can be fairly inexpensive and will definitely set your Wood Blinds apart from your neighbors. 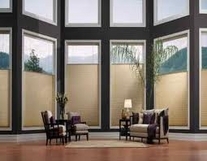 Sierra Shading can provide fashionable, functional, and coordinated Vertical Blinds for your home or business..
Vertical Blinds are offered in more than 200 colors & patterns. You can choose from linen & silk fabrics to bamboo and wood naturals and even stencil, sponged, and faux painted textures. Room darkening collections block out the maximum amount of light for privacy and daytime sleepers. Vertical blinds can be operated easily and offer colors & textures that coordinate with other window treatments. Sierra Shading can dress up your existing interior with the most luxurious and highest quality window covering available. Roman Shades are in a class of their own. 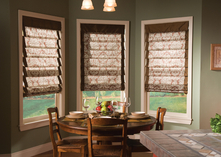 Roman Shades come in fabrics that range from vibrant stripes and rich solids to beautiful patterns and rich textures. The fabrics that eventually become Roman Shades are designed to fit any lifestyle and decor taste. It doesn't matter if your taste is traditional, contemporary, or somewhere in between. Roman Shade fabrics are typically light filtering but can be created as room darkening shades as well. Roman Shades are also offered in two different styles that add depth and dramatic presentation to any window. It's your choice, flat or hobbled. The picture to the right features the "hobbled" or rounded version.